These full body lycra suits, once a niche item for cosplayers and fetishists, are actually easy, everyday outfits. I'm thinking of replacing my snuggie with one of these. They lounge with their fiancés on sofabeds. They go to their desk jobs. They wait in line for the bathroom. They take leisurely neighborhood strolls. They love Apple products and other electronic gadgetry. They step out to get a breath of fresh air. 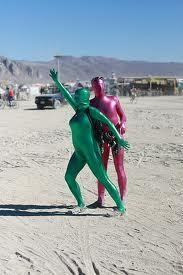 They have heart-to-hearts with fellow zentai-wearing friends. They go backpacking through Europe. They wait at the dentist's office, just like everybody else. They attend art gallery openings. They attend black tie events. They go to the beach. They say "I love you." They participate in student protests. They are totally relevant and famous pop stars.